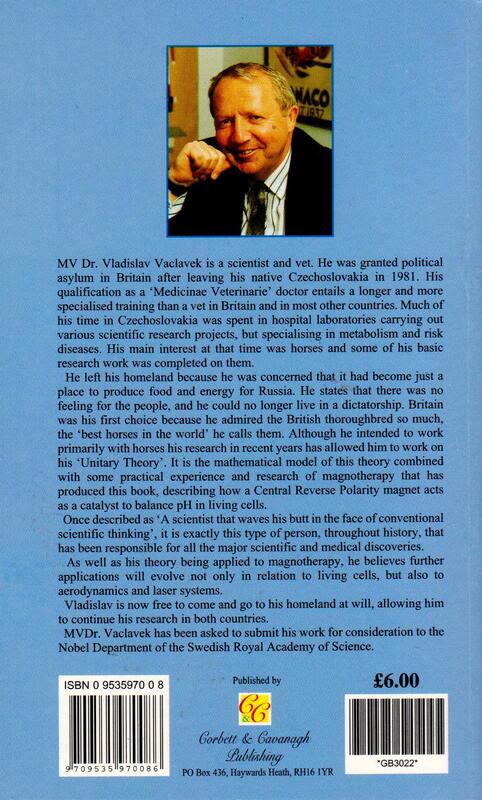 Published below is a copy of the book, ‘Magnotherapy the pHacts’, written by eminent cell biologist; MVDr Vladislav Vaclavek. In the book he explains the processes that Bioflow works on. He also explains the critical pH. balance of the cells of the body, and how he is sure Bioflow’s unique magnetic field helps to balance this using its specialised field. Be warned this can be a tough read in places, the more biological, chemical or physiological knowledge the reader has, the easier it is to understand it. We believe that this explanation in this book makes sense of the results we have been getting since 1998, and explains some logical reasons behind our treatment’s high level of success. I have highlighted some important areas of information in blue, to try to help people understand more about the science. In effect, we are confident what is happening with our treatment; is that it is helping the person’s body to heal itself from within, by helping to balance their body pH. This in turn helps the cell pumps (Or ‘Ion channels’ as they are properly called), to work better than before using our exclusive and unique ways of applying the Bioflow field. These cell pumps act as control valves, for the inward and outward flow of everything the cell requires. As these cell pump systems have serious effects on the balance of the cell or cells’ health if they are not working correctly, as explained in the book. Then logically therefore, making sure pH. is correct in the body is of an extremely high importance level as blood pH. is a major factor in cell pump health and efficiency, and therefore the health of the body at a cellular level. To show how important this is. If you search on the internet on any major disease, such as Parkinson’s disease, M.S., cystic fibrosis etc., followed by the words ‘ion channels’, it should show the connections between problems with ion channels and poor health. My personal interest in magnotherapy was aroused when lying in a hospital bed, in 1997, having been misdiagnosed as having angina. The patient in a neighbouring bed, recovering from a recent operation, told me how a magnetic bracelet was having such a positive effect on his recovery. Even his surgeon seemed to agree that it was helping. Being inquisitive by nature, and having specialised in the field of metabolism for much of my life, my thoughts kept asking why a magnet could have such an effect. Little did I know, then, where these thoughts would lead? As a MVDr. (Medicinae Veterinarie Doctor) I could not see any obvious reason why this man’s magnetic bracelet should have any effect on his healing and recovery period. 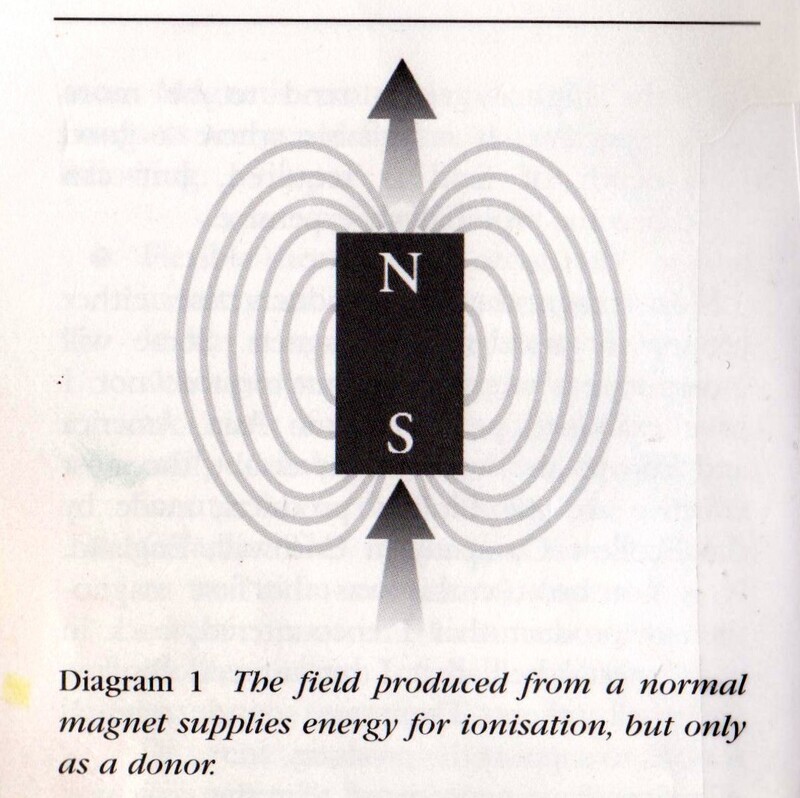 However, as a scientist, I could see exactly how a magnetic field could serve as a catalyst for ionisation, because I had spent many years prior to this developing my Unitary Theory centred on the balance between a donor and a recipient of energy. In fact, my work had just arrived at the point of using living cells as a mathematical model and I concluded that an understanding of the use of magnetic fields could hold the key to a new world of research in the field of medicine. Was it, therefore, pure chance that lying in the adjacent bed was a man who was providing evidence in support of my theory? With my own background medical knowledge, I did not believe I had angina, despite what I was being told. My own belief was that my condition was purely a result of an imbalance of body pH and, therefore, one that could be treated. I had previously used electrolyte minerals quite extensively in my work with horses, as a means of controlling the pH balance, producing some astounding results. The thought of combining this with a magnetic field was very exciting because, if my theory were correct, the benefits that the availability of electrolyte minerals could provide to the body would be further enhanced by the use of a magnetic field. The neighbouring patient was being discharged from hospital and offered me his bracelet which he always referred to as “my Bioflow”. I gratefully accepted his gift and asked my wife to find a supply of some key electrolyte minerals. Now was the time to test the conclusion of a lifetime’s work. Unknown to the doctors, I stopped taking the drugs they were prescribing and started treating myself with a combination of electrolytes similar to that which had produced such good results on horses, plus the Bioflow bracelet. Within two days my condition had improved and I discharged myself from hospital. Since that time I have not had any recurrence of the problem. On returning to my desk and library, all of my available time was spent researching the use of magnetic fields in connection with living animals and plants. I had, for some years, been developing my Unitary Theory, which was progressively tending to explain more and more anecdotal evidence. I am convinced that this theory has many applications. The prime one is to aid understanding of how our body can regulate and heal itself with minimal use of modern drugs. My investigation into the combination of magnotherapy, potassium availability and electrolyte balance in the body, was extremely encouraging because it fitted well within the framework of my theory. The history of magnotherapy is somewhat difficult to identify, as trying to separate the fact from the fiction is not easy. Magnets have been associated with improved health for thousands of years and the benefits appear to have been discovered independently by several, different cultures. There is evidence that magnetic iron minerals have been used by ancient civilisations in Africa, Australia, Egypt, Greece and Persia. It has even been said that Cleopatra used a magnetic substance to help preserve her beauty. Although this is a very romantic story there is little evidence to substantiate it. A naturally occurring rock, called Lode-stone, was probably the earliest magnetic material used for the purpose of promoting health and although the magnetic strength of Lodestone is very low, it was, and still is, freely available in quite large pieces. Perhaps the earliest practitioners simply filled their pockets with small stones of the material to obtain any benefit the Lodestone offered. Through the years that have followed hundreds, maybe even thousands, of magnetic products have been developed and have been marketed, although it must be said that the claims made for many of these products have been somewhat colourful and imaginative. In the absence of any scientifically provable explanations as to how a magnetic field can affect a living tissue, many theories have evolved. Naturally, some may be following the right lines, while others will have no substance whatsoever. One such theory that is often promoted is the suggestion that a North Pole, when applied to living tissue, is helpful for one type of condition but could adversely affect another. The South Pole is said to have the opposite effect. Of course, if this were true the whole animal kingdom living near the Arctic Circle would be suffering from one complaint while those living near the Antarctic Circle would be suffering from another. Although an explanation such as this provides a good story, I have not seen any acceptable evidence to support it and it does nothing for the cause of magnotherapy in gaining scientific or medical acceptance. Another popular theory is that a magnetic field ionises a component of the blood and this allows the blood to dissolve more oxygen. Although the ionisation part of this theory is correct, insofar as ionisation does occur, this has no effect on the solubility of oxygen. Strictly speaking, blood does not dissolve oxygen to any significant extent. The oxygen in the blood is associated specifically with the haemoglobin, which acts as a carrier of this oxygen. Haemoglobin is not ionised. Having attempted to research some of the background, I decided to explore the market and gather information from the people that are actually benefiting from magnets. The obvious place to start was with the manufacturers of the products. Unfortunately, this led me to a number of companies that appeared to be only interested in the financial gain of exploiting what was seen as an easy market. Simply wrapping a magnet in some fancy packaging and marketing it, accompanied by a pseudo-scientific explanation, does not seem, to me, to constitute an ethical business practice. It could, of course, always be argued that some level of benefit is accrued by the customer. However, my search did lead me to a British company, located in Cornwall, called Ecoflow Ltd, (Editors note – Ecoflow is now called Bioflow). At last I had found a source of useable data and information from a company that was genuinely interested in the market in which they were active. By coincidence, it was also this company that manufactured the Bioflow bracelet of the type my neighbour in the hospital bed had handed to me. It is not my intention to use this book as a means of recording endless case studies of people that have benefited from using magnets to help obtain relief from pain. Studies and trials have been completed in a number of countries, using both pulsed and static magnetic fields, with statistically significant therapeutic benefits being obtained in almost all cases. There are also thousands of user testimonials and I could fill this book with them but that, in itself would not help our understanding. Most of them were, and still are, simply dismissed by the medical and veterinary professions. More recently, however, the attitude to this complementary therapy has started to soften. Many professionals now tolerate it as something that can do no harm, while a few have started to incorporate it into their work. All too often, magnotherapy has been dismissed as a psychosomatic cure. This is contradicted, however, by the outstanding successes on animals. They have no knowledge of why the magnets are being applied to them, but the improvement in their health and quality of life is undeniable. The success rates are possibly higher than for humans. Indeed, it is probably these results that have prompted greater acceptance for this form of pain relief, and have also triggered some very positive trials in several countries. In many cases pain is a trigger telling the body to stop. It is nature’s way of telling us that we have a problem or that there is an impending one. To help reduce the sensation of pain many drugs are currently being consumed world- wide. Some are prescribed by doctors and some are purchased over the counter. Some are mild and some are dangerous in all but very small doses. Non-steroid anti-inflammatory drugs (NSAID’s) are commonly prescribed and consumed, even though they may produce various side effects if taken for an extended period. A recent study warned against long-term use of some of these drugs, particularly by the elderly. The steroid, or cortisone, family of drugs can also cause side effects, as can the simple aspirin. I am not suggesting that these drugs should not be used, because they do bring relief to millions of people, but where a risk free, natural, alternative is available then it should be considered. Frequently, more than one type of pain relief has to be tried before one is found to be effective. It may even require a combination of treatments. One difficulty is that the brain detects pain through the nervous system, but the cause of the pain is not necessarily where the brain expects it to be. This is called deferred pain and, because it often results in misdiagnosis: treatment may not be successful. Deferred pain is often apparent in the area of the shoulder and back. Relief of pain depends, to a large extent, or an understanding of the nature of pain. Almost all pain in soft tissues is caused by lactic acid. Athletes, both human and animal, suffer pain when the body’s tissues are being extended beyond their normal capabilities. Continued muscle use produces lactic acid and, in the language of the body, concentrated lactic acid means pain. Therefore, to relieve such pain, lactic acid must be reduced and, in the next chapter, this is dealt with in more detail. The success of modern magnotherapy as a means of relieving pain is partly due to the materials that have become available through advances in technology. Chapter 5 provides further information on the types of magnets and magnetic materials used in modern products. Magnotherapy’s success is also partly due to the fact that a magnetic field can attack pain right where it starts, at the sub atomic level. So, how does a magnet help to relieve pain and suffering, and promote healthy tissue maintenance and growth? The mechanism is probably very complex and it may not be a single process. Research suggests that it helps to control the acidity of the body. This leads to an improvement in the blood, which, in turn, allows the cell’s building supply and waste disposal system to work more efficiently. Human and animal bodies are very complex and efficient structures, although most of the body’s composition appears to be relatively simple. For example, 60-70% of body mass is water, and 99% of the body is composed of just four elements, oxygen, hydrogen, carbon and nitrogen. That leaves only 1% for a further twenty one essential elements that are required for the building and maintenance of the body. In many ways the body is like a car, requiring precisely the correct quantity and mixture of fuel to maximise and maintain it efficiently. Yet the fuel itself represents a very small part of the mass of the car. And just like a car, our bodies need optimum fuel in order to function efficiently without premature deterioration. As an example, the difference between petrol and diesel is only a few carbon atoms, but try to run your petrol driven car on diesel and you will soon see the difference a few atoms can make. Of course, our diet is extremely varied but, without the correct core ingredients, our “engine” would fail as assuredly as that of the car. The body is capable of a continual rebuilding and maintenance cycle, but to perform these tasks it requires a diet containing all the essential raw materials. Every day the human body manufactures and replaces 50 million new skin cells, and in a normal week the whole intestinal mucous system will have been replaced. These processes are taking place every minute of every day throughout our lives. Red blood cells have to be renewed once every four months. This is a mammoth task when you consider that just one teaspoon of blood contains about fifteen million red blood cells and the human body contains approximately five litres of blood. If a diet does not contain the necessary raw materials, or if their value has been diminished due to interaction with free radicals, each of these new blood cells will be damaged and less able to fulfill its role as the body’s transport system. Under normal circumstances, all mammals have two cycles of cell replacement. The first is the anabolic stage during which the body grows and develops almost automatically. The human cycle for this is approximately 25 years. The second stage is the catabolic stage, during which the body starts to break down those functions it no longer requires. If not exercised, muscle is replaced with fat, physical inactivity results in our bones losing both calcium and their strength, and mental activity slows down if mental faculties are not maintained. It is now acknowledged that many diseases plaguing the developed and developing world are connected to diet and lifestyle. For example, we know that diet, stress and smoking are factors that greatly influence our health. As a result people are beginning to show an ever-increasing interest in nutritional research. To withstand premature wear and tear, and to fight illness, it is important that the body receives the necessary raw materials; in the form of proteins, vitamins, minerals, trace elements, enzymes, as well as the essential fatty and amino acids. Remember that man, like all other animal life, has evolved over millions of years. During this period, any change in the diet has been the result of a very slow change in climatic and environmental conditions. This in turn has led to a gradual change in the availability of foodstuffs and nutrients on which the natural balance is based. Linked with increased wealth and understanding, this has made us taller, stronger and fitter than our ancestors of a few centuries ago. In the developed world, however, we are now seeing faster changes than ever before. This may result in an imbalance of nutrients. It is often claimed that “junk food” results in a diet too high in fat or salt. Our bodies are unable to accommodate such rapid, marked changes and health problems are likely to ensue. By and large, the natural animal kingdom is unaffected by this modern environmental change, but captive animals (this includes pets and farm animals) are equally affected. In the wild, animals are free to roam and can generally locate and select the food that is best suited to their body’s needs and condition, but captive animals rely on the animal feeds industry for a balanced diet. Captive animals, especially dogs, will sometimes eat grass for its nutritional or medicinal value. This seems to be instinctive. Unfortunately the world is too far down the road of genetic interference, artificial soil improvement, food preservation and corporate profit dominance, for this to be an option for all but a privileged few. The growth of the “organic food” industry, in which food is grown without fertilisers or pesticides, indicates that I am not alone in holding these views. If more attention is given to a diet taking account of the body’s natural requirements, metabolism and general health could be improved markedly. The body also needs plenty of fluids and the commonly suggested minimum daily intake of five glasses of water (preferably magnetically treated) is one that I support. The benefits of magnotherapy are the result of a change in pH that is triggered by magnetic energy. Although a basic understanding of biological functions will help the reader envisage pH control mechanisms. I shall endeavour, through this chapter, to explain the body’s interaction with a magnetic field in ways that do not require too much specialist knowledge. In order to understand pH we need to know something of the nature of electrolytes, both in general, and the ones that are responsible for many of the processes in the body. When materials dissolve in water they do so in one of two ways. They either keep the same composition as they had when they were solid, or they dissociate to form charged particles called “ions”. The split double arrow shows that the process is reversible and that if the water is evaporated the original substance is recovered. The charges on the two ions that are produced are what make the solution conduct electricity. Of course, when equal amounts of different substances are dissolved in water, their solutions will not all have the same electrical conductivity. This is because they do not all dissociate to the same extent. Some substances, when dissolved in water, will almost completely dissociate. There will be virtually no AB, only A+ and B-. Such substances are called strong electrolytes and some examples are hydrochloric acid and common salt. Other materials produce very little A+ and B- and exist mostly as AB. These are known as weak electrolytes and an example would be calcium carbonate. Different materials occupy different points on a scale all the way from very weak to very strong electrolytes. As a rough guide, the more soluble electrolytes tend to be the strong ones while the less soluble electrolytes tend to be the weak ones. The chemical definition of pH is, “The negative logarithm of the hydrogen ion activity”. What this means in practice is that we have a scale from 1 to 14 which measures acidity and alkalinity. An acid is a substance that produces hydrogen ions (H+) and an alkali is something that produces hydroxyl ions (OH-). In a neutral solution (e.g. pure water) the concentrations of hydrogen and hydroxyl ions are equal and the pH is 7.0. If the concentration of hydrogen ions (acidity) increases, the pH moves to lower numbers. If, on the other hand, the concentration of hydroxyl ions (alkalinity) increases, the pH moves to higher numbers. A very strong acid has a pH of 1 – 2 while a very strong alkali has a pH of 12 – 14. All living cells have a pH value that must be maintained within a very narrow range. Different body tissues have different levels of pH, but the importance of maintaining the correct balance is absolutely imperative to the life of the cell. Both human and animal bodies have in-built control systems, known as buffers, to monitor and stabilise the pH levels. The difference between an acid and an alkali is the net charge of the ion. An acid (low pH) has a positive charge and an alkali (high pH) has a negative charge. These charges can be altered only by the transfer of electrons. An acid may be neutralised by accepting electrons and an alkali may be neutralised by donating electrons. The movement of electrons in this way is known as oxidation (gaining electrons) and reduction (losing electrons). A magnetic field can act as a catalyst for ionisation; this is called ionisation by magnetic induction (IMI). Ionising water by means of IMI activates the oxygen to form positively charged and negatively charged entities by donating and receiving electrons (known as Co-ordinate Covalent Bonding). Oxygen oxidised or reduced in this way acts as a strong, natural buffer. We shall return to the subjects of the body’s electrolytes, ionisation of water and the influence of magnetism, in more detail later. In terms of our body’s electrolytes, we are, to a large extent, what we eat and drink. These days, most manufacturers of processed foods place a high emphasis on the vitamin and mineral content of their products. Many of these are added to help compensate for their destruction (in their natural form) prior to, or during, processing of the food. These components are essential to the body, but another aspect of nutrition appears to be largely overlooked. Food manufacturers should consider the all-important balance of the electrolytes (i.e. the balance of the major positive ions and negative ions). Electrolytes (particularly, potassium, sodium and chloride ions) are the body’s primary buffers as they accept or donate electrons in a water solution. These electrolytes are responsible for the “transmission” of charge through the body and control the pH, thereby influencing the level of lactic acid. The correct balance of potassium and sodium, for example, is instrumental in achieving a good metabolism and it is this balance that is crucial to the healthy maintenance of all life forms, from algae through to plants and on to the higher order of life forms. Unfortunately, it seems to me that modern food processing is playing an ever-increasing role in the change of this balance, far more quickly than the body can adjust. If conditions are changing we have to consider what they might affect. Perhaps two of the most important areas where pH control is relevant to pain relief are haemoglobin and the capillaries. Haemoglobin is the blood’s bus service for oxygen. It transports oxygen, from the lungs, to all the cells and the doors are controlled by pH. Too much acid and the doors start closing limiting the amount of oxygen to be delivered. Restore the pH balance and the doors open, allowing maximum oxygen supply. Although the veins and arteries are the motorways and main roads for blood distribution, it is the capillaries that are used as the final route for delivering the oxygen and nutrients to the cells and removing waste, including carbon dioxide and lactic acid, from those cells. The cell walls and capillary beds are sensitive to pH resulting in the blood flow being restricted when pH levels move to the acid state. Within minutes of applying a magnetic field, increases in blood flow of up to 300% have been measured in some extreme cases of poor blood distribution. This is a direct result of the blood pH returning to normal. So now a picture is emerging. Diet and electrolyte minerals are important in controlling pH, and pH is the information base of pain. Distribution of pain is in the capillaries. From this model, pain is seen to occur only if the boundary of acidic or alkaline zones is over-stepped and can occur in the form of either acidosis or alkalosis. The use of magnetic ionisation produces ions containing oxygen with strong oxidising or reducing capability. This helps to maintain acids and alkalis within the physiological balance, thus reducing or eliminating pain. Magnets have come a long way since those early practitioners of magnotherapy were walking around with pockets full of loadstone. Technology has improved materials immeasurably and today magnets are available in different shapes, materials and strengths. A magnetic field can be emitted from an electromagnet or a permanent (static) magnet. Electromagnets are capable of producing far more magnetic power than permanent magnets and these tend to be the domain of the professionals such as hospital physiotherapists. They are frequently used to produce pulsed magnetic fields where the frequency of the pulses can be varied. Producing portable, battery-operated electromagnets gives rise to a number of practical problems. Permanent magnets, on the other hand, offer the advantage of being small and compact and because of this are suitable for many applications relevant to magnotherapy. Products incorporating magnets have been marketed for attaching to just about every part of the body. Headbands, necklaces, bracelets, seat pads, inner soles, and belts are but a few of the magnetic products available. No doubt some of these work better than others. When we wear a magnetic product we are affecting body fluids and particularly the blood, which is the body’s transport system. It is called the circulatory system because that is what it does, it circulates. It is therefore fair to assume that treating fluids in one part of the body is going to carry the benefits to other parts. One magnetic product should, therefore, usually be sufficient for one body. Note, that I say ‘should’, as so much depends on the field of the magnet. Magnetic intensity is measured in units called gauss or, more recently, Tesla. One Tesla is equal to ten thousand gauss. Unfortunately, quoting the magnet’s performance in terms of gauss does not actually mean very much. This is because magnetic strength decreases very rapidly, on a logarithmic basis, as the distance from the magnet increases. Size is also important because the smaller the magnet, the faster the decrease. For example, a magnet with a Gauss of five thousand, at its surface, may only be placing one hundred Gauss or less into the actual surface body tissue. There is not any definitive Gauss measurement that is most suitable, although a good guide for continual or extended use is not less than three hundred gauss and a maximum of fifteen hundred gauss in the body tissue, not at the surface of the magnet. Rather than relying only on gauss as a means of measuring the performance of a product, consideration should be given to the depth of magnetic field. The depth of the magnetic field dictates the quantity of tissue that can be reached at any given time and is most important when targeting specific areas of the body. For those interested in safety it is worth noting that there is no recorded case of harm being caused, to a human, by a magnet of less than 20,000 gauss. A mere fifty years ago magnets were made of iron and slowly lost their magnetism, particularly in warm environments. Now we have magnetic materials with extremely long life. Flexible sheet. This is commonly used in industry and for advertising promotions. It has a very low depth of field and although some magnotherapy products are made from this material it is not really suitable. It is best left for its intended use of advertising. Ceramic. This is usually a boron, cobalt or strontium compound dispersed in a ceramic matrix. Ceramics offer an excellent depth of field and magnetic property retention at low weight. Different grades are available and this will generally be reflected in the price. A high grade, ceramic magnet is suitable for magnotherapy, particularly where a good depth of field is required, e.g. for back or thigh penetration. Neodymium. This is the most powerful magnetic material available. Hence it has the advantage that small light magnets can be made which are still strong enough to be suitable for magnotherapy. Again, different grades are available and the higher grades tend to be more expensive. It is suitable where a good depth of field is required, but can become prohibitively expensive. Most magnotherapy products use either ceramic or neodymium magnets. Some will incorporate a keeper plate, but most do not. I have examined products from Asia, America, and Europe and without any doubt the most effective are the Bioflow products, made by the Ecoflow Company in Cornwall, England. It is not because this was the first magnotherapy product that I encountered, back in that hospital bed, that I recommend Bioflow above all others. There are sound technical reasons to support the products. Ecoflow have appreciated that the only way that a magnetic field can have any effect on unconnected matter is by having a direct effect on the electrons. To amplify the ability of their magnets to perform this task they have invented a simple, and yet clever, arrangement of magnetic fields called Central Reverse Polarity (CRP). The CRP field is far superior to any other static magnet field used in magnotherapy because this field is specifically designed to move electrons. 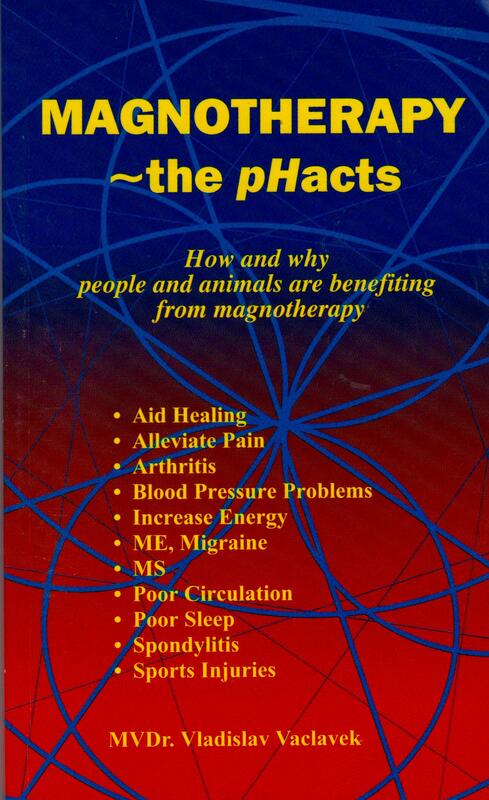 It is the moving of electrons that is the fundamental action of magnotherapy. Without the moving of electrons, pH levels cannot change. Ecoflow started business by applying magnets to fuel supply lines to improve fuel consumption in vehicles. When they turned their attention to gaseous fuels, for heating, the results were disappointing until they developed and patented, Central Reverse Polarity. This original CRP field only took account of uni-directional flow, whereas the CRP field designed for Bioflow allows for a multi-directional flow of matter through the field. This multi-directional field is ideal for body fluids. The Bioflow range is now extensive. Products made for humans are available in different styles, colours, sizes and strengths, while products are also made specifically for use on animals. All of these products have Central Reverse Polarity. Fat Dependent tissue -includes the kidney, liver and muscle. Glucose Dependent Tissue – includes the brain, red blood cells and the central nervous system. The majority of tissues in the mammal primarily use fat as a fuel. Tissues such as the kidney, liver and muscle, except during very severe exercise, use fat derived from circulating free fatty acids attached to plasma proteins. (Krebs H.A. – 1977). These tissues (Munro H.N. – 1977) and the mucosal cells of the gut (Munro H.N. – 1982) play an important role in amino acid metabolism. For the purposes of our discussion, however, the most important area is the glucose dependent tissue and we need to know something about the metabolism of glucose. Using glucose as an energy source produces lactic acid through a series of bio-chemical reactions called glycolysis. The metabolism, or breakdown, of glucose can be divided into two processes, the anaerobic process and the aerobic process. The anaerobic process requires no oxygen and occurs in the cytoplasm of the cells. This process is called anaerobic cell respiration. Metabolism of glucose, in which glucose is converted to lactic acid in the form of the negative lactate ion, is the emergency energy- producing process for the cells. When insufficient oxygen reaches the tissue, respiration can be maintained for a short time through anaerobic glycolysis. Lactate ions are oxidised by removing two hydrogen atoms, with their electrons, to form negative pyruvate ions. This process of removal of hydrogen from lactate is, in aerobic conditions, conducted by an enzyme called pyruvate dehydrogenase. With anaerobic respiration there is no suitable electron acceptor and all the carbon atoms in the pyruvic acid cannot be further converted into carbon dioxide. The aerobic process requires oxygen and it is this stage that produces most of the energy. These reactions also serve as the final stage of oxidation for other molecules used by the cell for energy production. The aerobic process takes place in the mitochondria, often called the “power plant” of the cell. The aerobic process involves two series of reactions. The first series is called the citric acid cycle and results in the final breakdown of the glucose to carbon dioxide. This breakdown of the glucose molecules consists of a series of oxidation reactions that remove hydrogen atoms. The hydrogen atoms, in turn, are used in the second series of oxidation / reduction reactions called the respiratory chain or electron transport chain. These reactions require the presence of hydrogen recipients (acceptors). If there is sufficient oxygen available during the last stage of glycolysis, no lactic acid is formed. Whenever lactic acid is formed, it must be removed from the body by conversion to pyruvic acid, either in the cells or after removal from the cells to the liver. A normal lactate-pyruvate balance is essential for all body functions. Stress and fatigue situations result in the over production of lactic acid. This occurs through the anaerobic process of breakdown of glucose, which results in prolonged lactic acid accumulation. Too much acid in the cells can eventually lead to a serious deterioration of health. Once the oxygen supply has become sufficient, lactic acid has to be eliminated by oxidation (the removal of electrons) to form pyruvic acid. Pyruvic acid can be utilised more easily by the body and therefore stops the saturation of lactic acid. Most importantly, the pH levels return to normal because pyruvic acid is a weaker acid than lactic acid. In this way hyperacidity is avoided. Reducing the concentration of lactic acid promotes the correct environment for aerobic respiration. Pyruvic acid acts as a buffer. This prevents the depletion of potassium. Because the oxidation of lactic acid to form pyruvic acid requires removal of hydrogen atoms and, particularly, electrons, the use of a Central Reverse Polarity magnetic field enhances this natural process. It is only when this conversion has taken place that the body can start to utilise fat as an energy source, because pyruvic acid is needed in that process. There are not many important sources of biochemical energy. The production of energy by anaerobic and aerobic glycolysis in the lactic acid cycle is very similar in all forms of life. Glycolysis supplies predominately the most sensitive points; the central nervous system, the brain and its derivatives, the retina and peripheral nerves, the blood cells, the renal medulla etc., simultaneously with areas under stress. All of these tissues are dependent on glucose as a fuel for respiration and cannot use fat or other substances in major quantities. Muscle can only partly use glucose as an energy source. The energy needs of the brain (about 25% of the total basal metabolism in an adult) have to be met by soluble energy materials that are I able to cross the blood/brain barrier. Under normal circumstances this is mainly glucose. Carbohydrates, especially glucose, are the major source of energy for cells. An adult human body will recycle 85% by the anaerobic mechanism and 15% is oxidised to carbon dioxide and water. The brain, which contains no storehouse of glucose, depends completely on glucose in the blood for its supply of energy. It is for this reason that the glucose level in, and pH of, blood is critical to brain function. The normal level of glucose in the blood of man (and horses) is 60 – 100mg per 100ml of blood. Any significant variation from normal, either too high or too low, can adversely affect the brain and nervous system. However, and in the case of man especially, the body is not supplied continuously with glucose because large meals are eaten followed by long periods of fasting. To overcome this, and to provide a continuous supply of energy to the brain cells, the body has developed a complicated control mechanism for keeping the blood sugar level fairly constant. Immediately after a meal the blood sugar level rises. To deal with this condition, the cells of the pancreas produce the hormone insulin. Insulin aids the passage of glucose into the liver, muscle, and fatty tissue cells, as well as encouraging the storage of glucose in the liver as glycogen. This process of converting glucose into glycogen is called glycogenesis. The glucose in the blood also diffuses into tissue cells. It can then be used to synthesise other essential molecules or can be broken down to yield useful cellular energy, through a process called cellular respiration. In aerobic cellular respiration, glucose is oxidised to form carbon dioxide, water and adenosine triphosphate (ATP). The cellular process of respiration is quite efficient. About 44% of the energy released from the oxidation of glucose is trapped in the high-energy bonds of ATP molecules and can be used to do work. The other 56% of energy is given off as heat in quantities more than enough to maintain the temperature at 37 degrees Centigrade. Any excess heat must be eliminated from the body through a cooling mechanism such as the evaporation of perspiration. Stressful situations in many species result in an oxygen debt. The production of lactic acid through anaerobic respiration results in an immediate energy release, but then a period of recovery is needed while the excess lactic acid is converted to pyruvic acid, and removed. This whole process requires much more oxygen than does unstressed aerobic respiration. During stress, muscle pyruvate dehydrogenase is reduced, thus conserving glucose as a fuel for glucose dependent cells. The long term regulation system of hydrogen seems to be closely connected with the biochemical rhythm of high energy. Bio-rhythms of the renal adaptation and buffering by bone salt (calcium) have a cycle of approximately three days. These scientific findings are identical to those used by trainers of human and animal athletes for many years and by doctors in the cycle of treatment. Exercise and recovery cycles are now quite widely recommended with adequate rest periods between bursts of activity in training. There is a variation in the proportion of organs described as glucose dependent and in, organs using fat as a fuel, at different stages of the life cycle and between mammals of different body size. (Munro H.N. – 1969). This proportion is not constant throughout life. At birth and in early life about 20% of the bodyweight of a human or a rat is skeleton muscle, rising to 36% in adolescence and 45% in a young adult. It then declines in old age to less than 30% of weight. The relative sizes and metabolic roles of liver and muscle are also affected by size of the mammal. These facts influence the metabolism of each individual. We have discussed the removal of lactic acid in the body by conversion to pyruvic acid in the cells, but the alternative is to transfer it from the cells to the liver. The liver converts about 75% of the lactic acid to glycogen and the rest to pyruvic acid, which is then oxidised in the citric acid cycle. The heavy breathing that occurs after strenuous exercise helps supply the oxygen necessary to oxidise the lactic acid. In emergencies doctors use oxygen masks to boost oxidation of pyruvic acid and free fatty acids and the oxidation of further lactic acid to pyruvic acid occurs. This technique is also used to speed recovery in certain sports, such as American football. The source of energy in an aerobic zone comes from the utilisation of free fatty acids and pyruvic acids (95%). Only 5% goes through anaerobic glycolysis. Mild alkalosis occurs. The Aerobic – Anaerobic Zone. Aerobic utilisation of free fatty acids range from 50% to 95%. A source of energy is lipids and glycids in the form of glycerol and glucose, relatively stable sources of pyruvic acid. Anaerobic metabolism is 5% to 50%. Mild acidosis occurs. The Anaerobic – Aerobic Zone. In this stage organisms use mostly an intracellular source of energy. Free fatty acids are low and the source of energy is still glycerol and glucose, both are relatively stable resources. A small quantity of pyruvic acid remains. Anaerobic metabolism is 50% to 95%. Aerobic metabolism is 5% to 50%. This stage results in acidosis with an increased production of lactic acid. A very severely anaerobic status. The anaerobic metabolism is over 95% and aerobic metabolism is less than 5%. As a fuel only intracellular resources are used. Free fatty acids and glycerol are not oxidised. Lactic acid production is very high with pyruvate production very low. Very severe acidosis can occur. This illustrates the difference between explosive activity and endurance events. The ability of a Central Reverse Polarity magnetic field to promote electron transfer is valuable in all activities as an aid to recovery. However, those whose performance will gain most are the sports people engaged in events, which last longer than a few minutes. In every cell, of both human and animal bodies, the successful transmission of electrical charges is essential to all bodily functions. However, the transmission of electrical charges can only take place in the presence of electrolytes (mostly potassium sodium and chloride). My contention is that magnetic energy acts on these electrolytes and enhances this conductivity in all living organisms, with a variety of benefits. Electrolytes perform many regulatory roles in our bodies, as well as being responsible for the maintenance of the acid-base equilibrium and water balance. 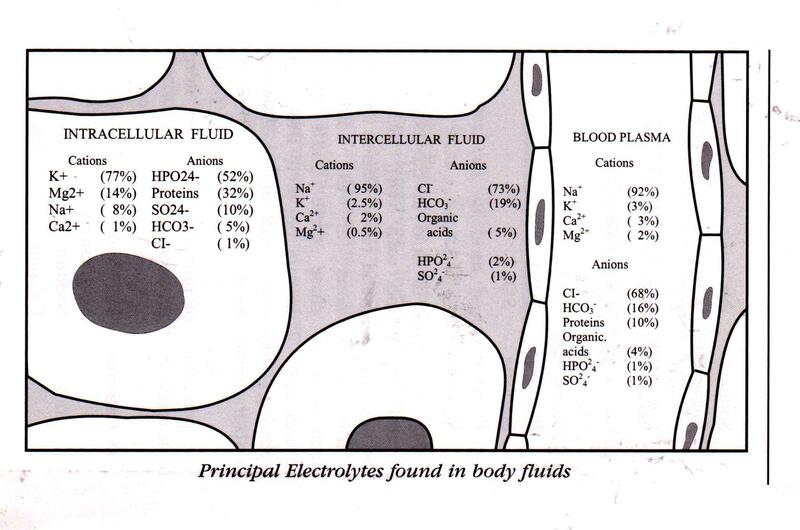 The three types of fluid in the body are intracellular (within each cell), interstitial (between the cells) and blood plasma, and the relative proportions of the different electrolytes in these three fluids varies considerably. This can be seen from the following compositions that are also shown in diagrammatic form, overleaf. Many of the elements necessary for life are found in the form of their ions. These ions act as control agents in a number of processes involving energy production and cell building and maintenance. Of particular importance is the ubiquitous potassium. Potassium belongs to the “electric three” together with sodium and chlorine. These elements are a constant reminder of our “fishy” heritage because in many ways they produce a private piece of the ocean from our past, aquatic, beginning of evolution. These three elements are in many ways life’s blue print in the animal world. Potassium and sodium, combined with chlorine (as chlorides), exhibit a strange tug-of-war relationship within our bodies and complex, but always changing relationship evolves around the concentrations of the two elements. It is very important to understand this as both potassium and sodium are very important to health and general wellbeing. Looking at food from the point of view of omnipotent designer, it could be successfully argued that man evolved to eat food containing much more potassium than sodium. Unfortunately, sodium chloride (salt) is much more readily available, geologically, than potassium chloride and is, therefore, much cheaper. Consequently, we have always used it to cook food, flavour food and even preserve food. As a result, the modern diet contains much more sodium than potassium. This is despite the fact that the human body contains twice as much potassium as sodium (250g of potassium compared with 100g of sodium). There is increasing concern about the effects of low potassium intakes in modern diets. Deficiency symptoms include abnormal tiredness, irritability, headaches, swelling of the feet and ankles, heart palpitations, bone and joint pains, and oedema. Something like 98% of the body’s potassium is found inside the cells and this differs radically from sodium, which is mainly extra-cellular. When food containing a high potassium content is eaten, about 90% of the ingested potassium is absorbed, although the level of potassium in the blood remains constant. Coupled with magnesium, potassium is very much involved in the regulation of the heart’s rhythm. Potassium deficiency was identified as a culprit in a disorderly action of the heart that occurred during the Apollo1 astronauts lunar exploration flights of David Scott and James Irwin. By the time the Apollo 16 astronaut exercise was mounted potassium enriched food was incorporated in the diets on this and all subsequent astronaut programmes and no untoward depletion symptoms developed. (Dr. Eric Trimmer 1987). For some people, potassium deficiency caused by medication. Treatment with diuretic drugs, some blood pressure drugs, beta-blockers, and long-term cortisone treatment, can all cause depletion of potassium. These drugs are the “water pills” that some patients have to take if they are to avoid “water logging” of their tissues. This can be the result of heart failure when tissue fluid accumulates in the legs or abdomen causing swelling dyspepsia, or in the lungs causing coughing and breathlessness. Unfortunately most diuretic drugs used to treat this sort problem cause excessive potassium loss for the body and disturbance of the sodium / potassium ratio, unless adequate potassium supplements are taken. Another fascinating aspect of mineral health control is the relationship between potassium and energy. Without adequate cellular potassium the body has difficulty in converting blood sugar into glycogen, which can be looked upon as an instant energy, “storage pack”, convertible into energy very rapidly. In the absence of adequate potassium, the blood sugar tends to rise which, in turn, stimulates a need for extra insulin to be secreted, and the diabetic process is essentially one of increased insulin demand. The magic of magnesium is also closely tied with potassium with regard to energy promotion, providing yet another link between magnesium and the electrolytes. (Dr. Eric Trimmer – 1987). Elsewhere in the literature, the influence of potassium on vasodilatation has been described. Potassium depletion diminishes the vascular response to exercise and plays a role in the exertional rhabdomyolysis seen in military recruits during intense physical training in hot climates. (Greenberg and Arneson 1967; Knochel 1972, 1982; Smith 1968). In a similar situation, exhausted endurance horses had the same diminished vascular response. (Carlson and Nelson 1976). Potassium has also been reported to play a very important role in enzymatic reactions, nerve conditions, maintenance of cell membrane potentials and muscle contraction / relaxation. It is, therefore, imperative that we endeavour to maintain a correct potassium level and our lifestyle has an important part to play. Caffeine, alcohol and all strong sources of free radicals (pollution, smoking, etc.) are responsible for the depletion of potassium and the imbalance of electrolytes and pH of the tissues. The correct level of potassium in the body is very important in maintaining healthy skin and bone structures and diet is one of the keys. Children who are not breast-fed take in, with their food, a substantial phosphate load, together with perhaps more vitamin D than is appropriate. This is due to differences in com- position of human milk and formula feed milk (cow’s milk). Both phosphate and vitamin D tend to lower tissue magnesium and potassium levels. This can lead to artery changes. Animal experiments have repeatedly confirmed that a similar state of affairs can be duplicated in the laboratory. Artery changes can be produced “to order” in rats by feeding them on a low magnesium / potassium, high calcium diets. The addition of a high proportion of fat to the diet increases the degree of arteriosclerosis. During the 80’s research workers devised an experimental diet that so damaged the arteries of the rats, dogs and cockerels that were fed on it, that 80-90% of these animals died of coronary disease. The diet was high in fat, cholesterol, vitamin D, phosphate and protein and low in magnesium, potassium and chloride. It was nicknamed the “cardiovasopathic” diet and it is remarkably close, in many ways, to the sort of food many people tend to favour, for everyday consumption, in our western society. (Dr. Eric Trimmer 1987). Moving away from the “cardiovasopathic” diet involves eating less fat, less vitamin D, sodium, phosphate and protein. In a quite simple way, magnesium and potassium supplements, on a long-term basis, can help prevent some of the dangers of improper eating. Alternatively, foods high in potassium and magnesium should be eaten regularly. Diet related depletion of potassium is a very serious problem in modern diet as “junk food”, which is rich in sodium, depletes potassium. This is also the case with modern food preservation methods (freezing, canning etc.) and processing methods. Consequently many people are now heeding medical advice to reduce their salt intake. Foods rich in vitamin D, calcium and phosphorus all play a role in depletion of potassium. Perspiring also causes depletion of potassium and sodium. In one litre of human sweat 0.75g of sodium, 0.18g of potassium and 1.2g of chloride are lost. In horses the loss is three times as much sodium chloride and five to ten times as much potassium. Depletion of sodium chloride (NaCl) usually found in hot climates. Clinical depletion of sodium chloride is described a vertigo (light headedness) as a result of lowered blood pressure. Sodium ions, in the form of sodium bicarbonate, are depleted in blood serum after severe exercise. After sodium ingestion, blood bicarbonate levels increase to promote the efflux of lactate and hydrogen ions (H+) out of the muscle tissue and into the blood. Although a dietary excess of vitamin D is undesirable, a certain amount is essential. The kidney is the site of the final production of active vitamin D. If it fails, so production of vitamin D falls away. This results in a failure of calcium absorption from the bowel and failure of normal re-modelling of the bone. The resulting condition depends on whether the individual has stopped growing or not. If still in the growth cycle then rickets appears, with defective growth, bowed legs and broadening of the wrists and ankles. If growth has stopped then softening of the bones appears, noticeable mainly by pain in the pelvis and hips. Electrolytes alter osmosis, blood pressure, the function of the heart and kidneys. Although essential under normal circumstances, this power makes them generally detrimental to bodily functions, when the balance between acids and bases (the pH balance) is not correct. There are twelve salts that give rise to these electrolytes. These salts are inorganic mineral components of our body tissues. They are also known as Schuessler biochemical cell units after Dr. W.H. Schuessler, who isolated then in the 19th century. Dr. Schuessler found that if the body was deficient in any of these salts illness occurred and that if the deficiency was corrected, the body could heal itself of such illnesses. Calcium fluoride. Part of all the body connective tissue. An imbalance can the cause of varicose veins, late dentition muscle tendon strain, carbuncles and cracked skin. Calcium phosphate. Found in all of the body’s cells and fluids. It is an important component in gastric juices as well bones and teeth. An imbalance deficiency can be the cause of cold hand and feet, numbness, hydrocele, sore breasts and night sweats. Calcium sulphate. Is a constituent all connective tissues in minute particles as well as in the cells of the liver. An imbalance or deficiency can be the cause f skin eruptions, deep abscesses or chronic oozing ulcers. Ferrous phosphate. Part of the blood and other body cells, with the exception of nerves. An imbalance or deficiency can be the cause of continuous diarrhoea paradoxically, constipation. It has been used as a remedy for nosebleeds and excessive menses. Potassium chloride. Found in and under the surface body cell imbalance or deficiency can be the cause of granulation of the eyelids, blistering, eczema and warts. Potassium sulphate. This salt interacts with the cells that form skin and in organ linings. An imbalance or deficiency can be the cause of skin eruptions, yellowing of the tongue, feelings of heaviness and pains in the limbs. Potassium phosphate. Found body tissues, particularly nerve, and blood cells. An imbalance or deficiency can be the cause of improper fat digestion, poor memory, anxiety, insomnia and a faint, rapid pulse. Magnesium phosphate. Another mineral element of bones, teeth, brain, nerves, blood and muscle cells. An imbalance or deficiency can be the cause of cramps, neuralgia, shooting pains and colic. Sodium chloride. Regulates the amount of moisture in the body and carries moisture to cells. An imbalance or deficiency can be the cause of salt cravings, hay fever and watery discharges from the eyes and nose. Sodium phosphate. Emulsifies fatty acids and keeps uric acid soluble in the blood. An imbalance or deficiency can be the cause of jaundice, sour breath and acid or coppery taste in the mouth. Sodium sulphate. Is a slight irritant to tissues and functions as a stimulant for natural secretions. An imbalance, or deficiency, can be the cause of low fever, oedema, depression and gall bladder disorders. Silicic acid. Part of all connective tissue cells, as well as those of the hair, nail and skin. A deficiency or imbalance can be the cause of poor memory, carbuncles, falling hair and ribbed in-growing toenails. It is my belief that the use of a Central Reverse Polarity magnetic field has a three-fold effect on the body’s energy levels. For any chemical or biochemical reaction to occur between two molecules they must be brought sufficiently close for their outer shell electrons to interact. In fact they must collide and overcome the repelling forces between the electrons surrounding the nuclei. The amount of energy necessary for a successful collision is called the activation energy. In many cases this energy is provided by warming up the things that are going to react. The molecules react more quickly when they are hot and the reaction is slower when they are cool. When the molecules start to react, one of two things will happen. Most reactions are exothermic which means that energy is released. They get hot and this provides more energy to activate more molecules. The reaction becomes self-sustaining until one of the reactants is all gone. Exothermic reactions result when the products of the reaction have less potential energy than the reactants. With an endothermic reaction, on the other hand, energy is taken in instead of being given out. In order for the reaction to continue it has to be continually supplied with more energy. An example is the decomposition of water into hydrogen and oxygen, which requires a continuous input of energy and is, therefore, endothermic. One very common process is ionisation and, here, magnetic energy can play a very important role. It provides a source of activation energy in exothermic energy release, a source of activation energy in endothermic energy absorption, and most importantly it acts as a catalyst of ionisation processes. We briefly touched on ionisation in our discussion of pH and now need to look at it in a little more detail. For example, the difference between acids and bases. Acids are compounds that when dissolved in water will produce a solution that tastes sour. This is because the one thing that all acids have in common is that, when dissolved in water, one of the ions that they produce is the hydrogen ion (H+). For reasons that need not concern us here, the hydrogen ion is always thought of as being attached to a molecule of water. In this form it is called a hydronium ion (H3O+). Hydronium ions (H3O+) are cations which act as a major buffer in the carbonic acid / bicarbonate system without any alteration of pH in the body. The reverse reaction produces two molecules of water, in the same way as the neutralisation of an acid and a base, without any alteration of pH. Pure water is a very weak electrolyte and only a minute proportion of the water undergoes this ionisation in the absence of any external influence. A magnetic field causes a higher proportion of the water to ionise. The smallest change in hydrogen ion concentration is of great importance to living cells. pH is the vital indicator in all the processes of living organisms. On the pH scale pure water is neutral and is marked as 7.0. 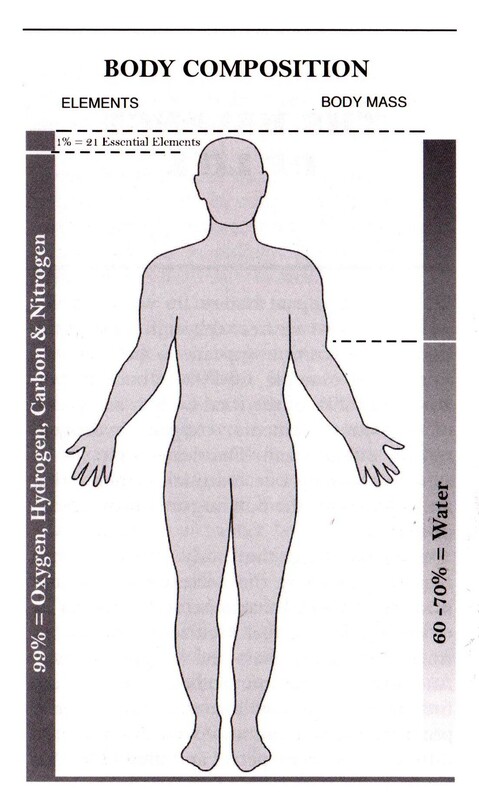 In the human body the blood plasma has normal pH of 7.4. If the pH should fall below 7.0 or rise above 7.8 the results would be fatal. The buffer systems in the blood are very effective in preventing this fluid from experiencing large changes in pH. The major’ buffer system in the blood is the carbonic acid – bicarbonate system. Buffers are substances that, when present in solution, resist sudden changes in pH. In particular they protect against large changes in pH when acids and bases are added to any solution. Living cells are extremely sensitive to even very slight changes in pH. The reason for this sensitivity is that the enzymes, which catalyse metabolic reactions operate in only a small range of pH. Altering the pH will slow down or stop the action of an enzyme. The body cells, extracellular fluid, and blood have each developed buffer systems that protect against pH changes. pH in body fluids is controlled through the buffering of hydronium ions and hydroxyl ions. A hydronium ion acts as a strong acid in solution and a hydroxyl ion acts as a strong base. In normal circumstances, the result of a reaction between an acid and a base is salt. The following are some examples of such buffering. Because magnetic ionisation of the water in our body increases the amount of hydronium ions available for buffering, these reactions are facilitated. Cell’s ions play an essential role in a wide variety of processes, such as bioenergetics, signalling and catalysing of chemical reactions. They are also used for maintaining the biological structures. In order to enter cells, ions must permeate the lipid membranes, which form the cell walls. 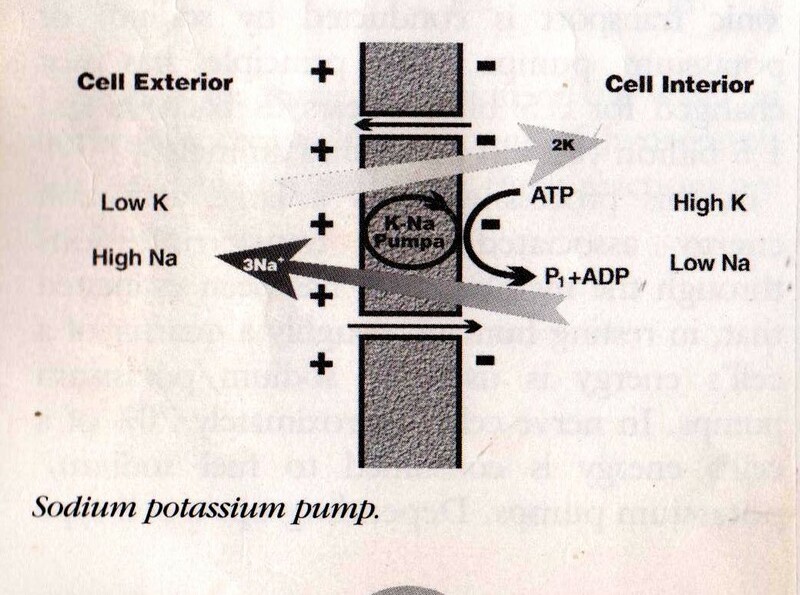 The majority of ionic transport is conducted by sodium or potassium pumps. The principle has not changed for 3.5 billion years in bacteria and 1.5 billion years in plants and animals. In this process there is a large activation energy associated with transferring ions through the membrane. It has been estimated that, in resting humans, roughly a quarter of a cell’s energy is used by sodium / potassium pumps. In nerve cells, approximately 70% of a cell’s energy is consumed to fuel sodium / potassium pumps. Depending upon cell type there are between 800,000 and 3,000,000 pumps on the surface of cells. Every living cell in the human body is an electromagnetic unit and all living organisms emit certain electromagnetic waves. The pH level of each cell is very finely tuned and very sensitive. Maintaining the correct state of electro-conductivity is vital to the cell’s survival. One way that our body is able to regulate a cell’s electro-conductivity is through the use of four main positive ions (sodium, potassium, calcium and magnesium) which facilitate the correct balance of positive and negative ions. It is the balance of these inter-acting electrolytes in the body that is important, more than the amount of anyone of them, including sodium (Salt Institute UK 1999). The electrolytes enter, and leave, each cell through a series of dedicated pumps, or ion channels, some of which are electrically sensitive. These pumps are able to react to changes in a cell’s pH and adjust the balance appropriately by pumping the required electrolyte, in or out. Such an imbalance, in the form of excess lactic acid being formed by the body, can be caused by the rigours of modern living. An excess of lactic acid has a detrimental effect on a cell’s pH. Stage 1 Cell not receiving or using oxygen. Stage 2 Cell shifts to anaerobic metabolism. Stage 3 Sodium and potassium pumps fail. Stage 4 Sodium moves into cell and water follows -potassium exits. Stage 5 Water drawn from vascular space. Stage 7 Severe acidosis and release of cellular enzymes, cellular self- destruction, inflammation. An imbalance in the function of the pumps manifests itself in different ways in different parts of the body. For example, if it occurs in the red blood cells there is an inability to transport oxygen to the other tissues of the body and respiratory acidosis occurs. If the imbalance occurs in the pumps of the central nervous system, the result can be pain, psychotropic disorders and neuro-degradation such as Parkinson’s disease, Alzheimer’s disease, etc. In the immune system, an imbalance in pump function can result in autoimmunity or allergies. The function of pumps in the smooth muscle and skeletal muscle are particularly relevant to excitability and contractibility. Thus, an imbalance in these pumps can give rise to arrhythmia, hypertension, asthma impotence and myotonia. Bone is a dynamic tissue that undergoes constant remodelling. The importance of the role of pumps in this process is that they allow for the inward passage of potassium and the outward flow of chloride. This prevents the accumulation of acids which can lead to bone disease or osteoporosis. It is easy to see, therefore, that it is essential that sodium, potassium, calcium and magnesium are present in sufficient quantities; and correctly balanced, in order to provide the vital controls. The mechanism of control of the balancing of sodium / potassium pumps is by hormones. For example, thyroid hormones appear to be major players in maintaining steady state conditions of pumps in most tissues. The catecholamine family have varied effects, depending upon the specific hormone and tissue. It is known, for example, that they can inhibit sodium / potassium pumps in the kidneys or stimulate pump activity in skeletal muscle. Insulin is a major regulator of potassium homeostasis and has multiple effects on sodium pump activity. Within minutes of elevating insulin secretion, pumps increase affinity for sodium and increase turnover rate. In skeletal muscle, insulin may also activate latent pumps that are already present. Aldosterone has been shown to stimulate exchange of sodium and potassium. Small increases in blood levels of potassium strongly stimulate aldosterone secretion. Aldosterone has effects on sweat glands, salivary gland and the colon. The study of ion channels (pumps), pores through which ions cross cell membranes, has been a booming research field since 1984 when the first sodium channel was isolated. The first potassium channel was found in 1987. Since then ion channels have been isolated from all tissues from brain to kidneys, and from all specie from bacteria to humans, and shown to have considerable influence on physiology. Mutations to ion channels have be shown to underlie such disorders as cystic fibrosis, the long QT syndrome, hereditary hypertension and a variety of hereditable myopathies. A high intercellular potassium / sodium ratio is associated with reduced cancer incidence. In those inhabited areas where water and have a high potassium/sodium ratio, un-expectedly low cancer incidence is found. In several countries, high potassium diets are associated with low rates of cancer incidence, while high sodium diets are associated with high rates of cancer incidence. There is even a cancer therapy (the Gerson therapy) based on restoring the balance of potassium and sodium in the body. Dr Gerson maintained that cancer alters the body’s normal sodium / potassium balance, already disturbed by the modern over-salted diet. Liver, brain and muscle cells normally have much higher levels of potassium than of sodium but, in cancer patients, this ratio is reversed. The therapeutic diet emphasises foods rich in potassium and low in sodium. Patients also take a potassium solution, added to fruit juices, ten times daily. Over the years, the Gerson therapy has yielded an impressive number of long-term cancer survivors, all of whom had well-documented illnesses. In some cases they had been termed “incurable” by their orthodox physicians. The American Medical Association found that potassium supplementation lowered blood pressure in people with hypertension. In the UK, in 1994, the Department of Health published a report by the Cardiovascular Review Group Committee on Medical Aspects of Food Policy. It contained the statement that “higher dietary potassium intake may reduce blood pressure”. A diet lower in common salt and higher in potassium would be expected to result in lower blood pressure. Cardiac arrhythmias can be corrected by potassium supplementation. In pulmonary medicine, the regulation of the sodium/potassium pumps is a critical element in reabsorbing fluid from the alveolar space in pulmonary oedema. Modern farming and food processing methods, and the drive to cut costs, have resulted in a depletion of potassium and magnesium in the soil. The result is that much the food that we eat, today, does not contain sufficient quantities of the essential minerals and electrolytes that our body requires for healthy living. Potassium is also depleted by lifestyle factors such as smoking, stress and pollution. Reduced concentrations of potassium, magnesium and sodium/ potassium pumps in human skeletal muscle has been reported during treatment with diuretics. One popular area of research and development in recent years has been with fuel cells. These generate electricity directly from chemical reactions and are now used to power experimental vehicles. Our bodies got there first. The human body can be considered as comprised of millions of fuel cells. Small electrical impulses are what drive processes in the body and these flows of electrons need to be facilitated. It is the water in the body that makes this happen. Hydrogen-oxygen bonds are broken to obtain a flow of energy in the form of electrons. This flow of electrons is controlled by units called “anti-oxidants” and the final acceptor of the electrons is oxygen. Inadequate control of this flow creates mixed radicals, which cause serious damage. Insufficient oxygen capacity has the same effect. If water in the body is in a high-energy state it will ionise more readily. It can then act as a donor of energy to bond oxygen to iron and accept electron transport energy, as the final acceptor. Water must be in this state to eliminate free radicals by surrounding (solvating) them. When this process is inhibited it results in what we term “illness”. The body’s natural mechanism for keeping its water in the required high-energy state is to keep it warm. Approximately 37°C is the norm and about 45% of all energy produced by the body is used in maintaining this temperature. Oxygen debt can be generated from several causes. Sporting exertion, shock and sepsis are the main ones. In each case the body needs to increase utilisation of oxygen. This means increasing temperature so that the water in; our body can more easily ionise and act as the conduit for the electrons to allow better bonding of oxygen. This is why we keep people warm when they are in shock. It is why we heat up during physical exertion and why our temperature rises when we have an infection. In fact the body will continue to generate heat until there is sufficient utilisation of oxygen to meet the requirements of the situation – hence fever in extreme cases. There are times when the body has insufficient capacity without being life threatening. This can be through systems winding down as we get older or injury due to some physical activity. At such times the body could do with some help and this is where magnotherapy comes in. If we treat the water component of our blood we improve the bonding of oxygen to the iron of haemoglobin and this, by circulation, treats the whole body. For localised problems we can apply a more penetrating field to the appropriate area and directly affect the water in the cells. 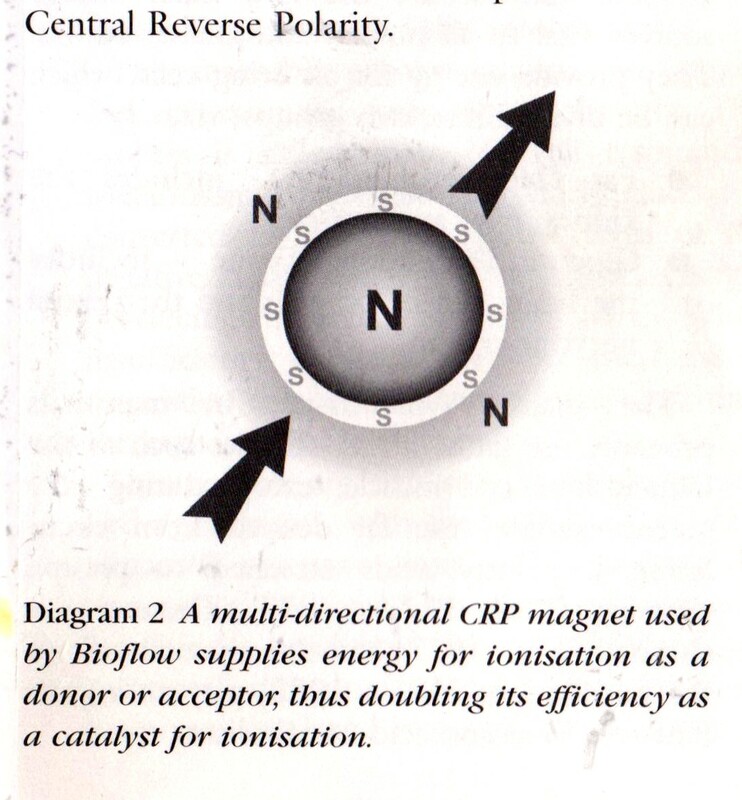 The Central Reverse Polarity (CRP) magnet is specifically designed to move electrons, which enables the body’s pH levels to change by activation of sodium/potassium pumps. In a similar way, increasing electrolyte levels, through a supplement, will activate the sodium/potassium and magnesium/calcium pumps within the body, affecting the pH level of each cell. Many common ailments such as allergies, asthma and arthritis have been successfully treated with CRP magnets. More serious conditions such as cancer and Alzheimer’s, which are the result of cell mutation and destruction, can, in theory, be prevented and/or treated by the combined application of magnet therapy and a suitable electrolyte supplement. In the average body, a cell that is “stressed” will go through all the stages of shock previously described. In efforts to prevent the final stages of destruction, the body releases hormones to redress the potassium/sodium balance within the cell. When cells lose their potassium content into the bloodstream, the central nervous system releases specific hormones, which control the activity of cellular pumps. Once the potassium/sodium balance has been restored, the cell’s oxygen content increases and aerobic metabolism resumes. A correctly balanced electrolyte supplement temporarily increases the amount of potassium in the bloodstream, mimicking the reaction of a stressed cell. This potassium increase triggers the release of the regulatory hormones from the central nervous system, which, in turn, stimulates the cellular pumps. The potassium/sodium balance is restored, the cell’s oxygen content is increased and aerobic metabolism is resumed. In other words, the process of destruction is stopped and the cell returns to normal health. If the balance of electrolytes within the cell was already correct, the unwanted potassium is excreted naturally. If it was not correct, the electrolytes are absorbed into the cell and utilised. This makes the moderate consumption of a correctly balanced electrolyte supplement a powerful self- healing treatment, which has no side effects.